Discussion topic, short definition for security? If you would need to explain security in an easy way, how would you define it? I came up with 2 definitions. 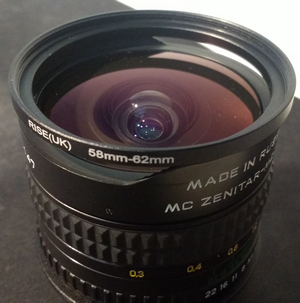 Some camera lenses like Zenitar 16mm (F2.8) do not have a commonly used filter thread at the front of the lens. However, it is possible to make your own adapter. An easy non-destructive way is to used filter adapter rings and some tape. For landscape and sky photos this might be good enough solution. In the pictures below: on left, the 58/62 ring rests on top of the lens frame. on right, the 58/62 ring is being placed inside the tube and next will be covered by the last 67/77 step-up ring. 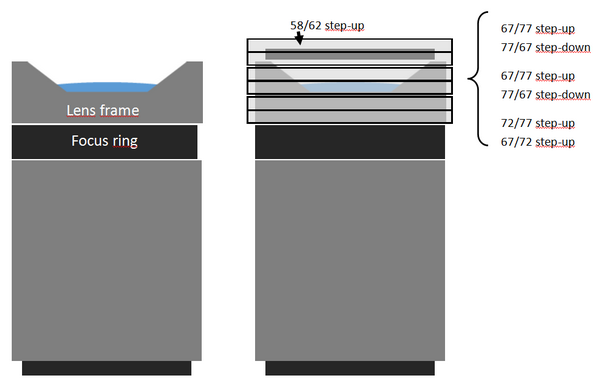 In this DIY solution, an adapter ring 58/62mm is placed inside a tube made by 67/77 (step-up) & 77/67 (step-down) adapter rings. 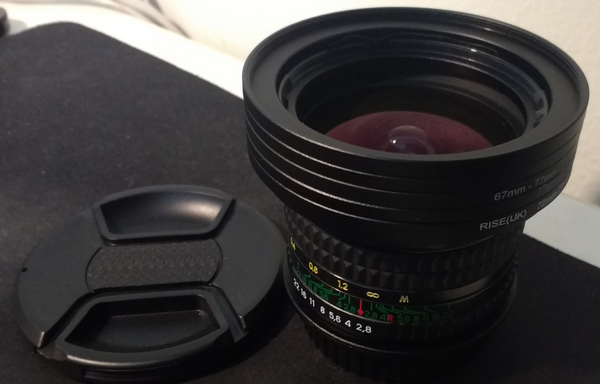 The 58/62 ring prevents the tube moving too close to the lens. Some tape around this 58/62 ring is needed. Also about 3 rounds of tape is needed around the lens frame to make the tube to fit tight to the lens. 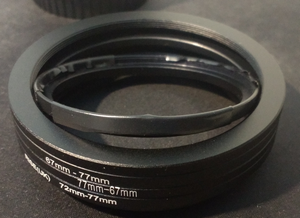 The focus ring is left free, as the adapter tube is short enough. 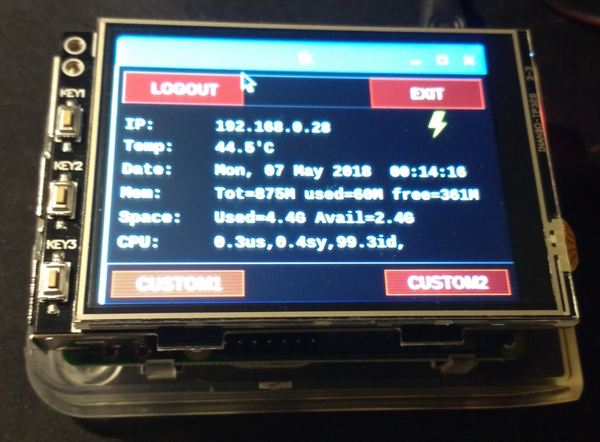 A tiny touchscreen on portable Raspberry PI (RPI) might be very helpfull for showing sensor values or key performance data like memory, CPU level or disk space left. My intention is to build a portable air quality monitoring tool based on RPI. This monitoring system will be able to show values of temperature, humidity and dust level. First I tried to get the screen working with the current raspbian OS. After some trial and error, I decided to try the manufacturer’s OS image. And as it was working right away, then I continued with that path. Remember to use “sudo raspi-config” command to configure your keyboard, localization, time etc. One can clean up and remove the unnecessary packages, eg. wolfram-engine, libreoffice, sonic-pi and minecraft. At first I tried to use the text mode in console, but this display (with 320×240 pixels) is still too small for anything more serious work. It is better to use the ssh (putty) over wifi to operate anything on command line. However, if you wish to use the text mode, then one can use “sudo raspi-config” to activate booting into text mode. And the font for the console can be set in console-setup file by adding 2 lines, see below (see link). It is possible to utilize a virtual keyboard (eg. matchbox-keyboard) , and use the mouse for typing (see link). And/or one could simply activate a screensaver called termsaver, which has several utilities like matrix, clock and system monitor. 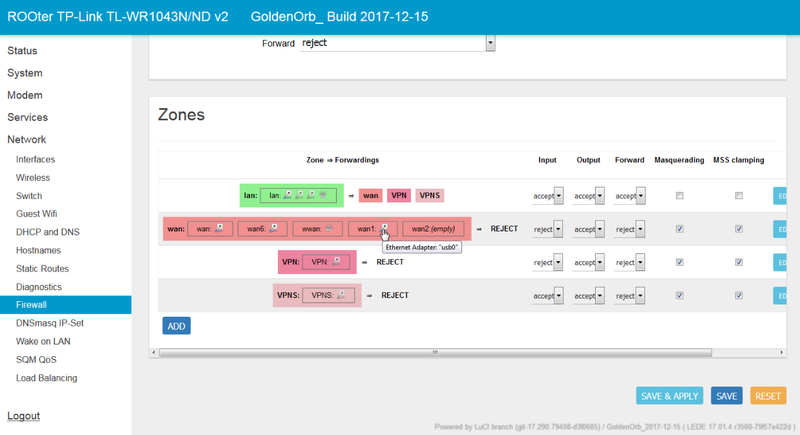 pitkgui script in github was used as a base for the customized script, and it can be modified to provide different performance values to be monitored. 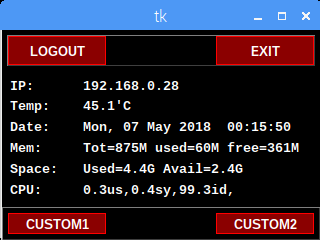 The screenshot below shows the output of the customized script (pitkgui-custom.py). (The screenshot is taken with scrot command. One can install it with “sudo apt-get install scrot” command). Previously I managed to get the OpenWRT working on a wireless router. As this router also has an USB port, I tried to get an USB 4G dongle working on it. After realizing that the solution is very much dependent on router itself and on the 4G dongle, and that I simply didn’t have all the details that was needed, then I gave up on that attempt. And then I found that there is another effort/package called ROOTer, which is actually solving the very same problem for several routers and dongles. And that my specific HW was actually supported! After following their instructions, and installing their firmware, it worked “out of the box” (all actions from the GUI, without needing to do tweaks on the command line.) The only catch up to remember is that one need to configure the Modem data (eg. APN name, authentication etc), and when changing those parameters, they don’t become active until reboot is made. 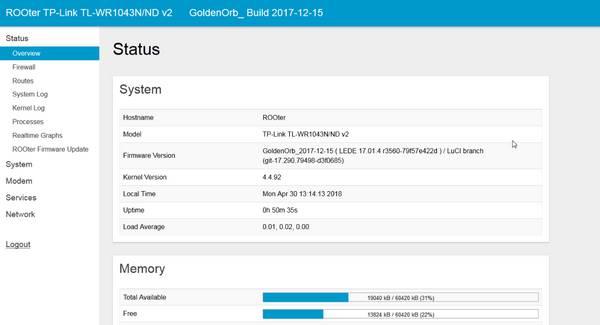 In picture below, the model name and firmware are visible. In next picture, it shows that the interface wan1 (4G dongle on USB) is up. 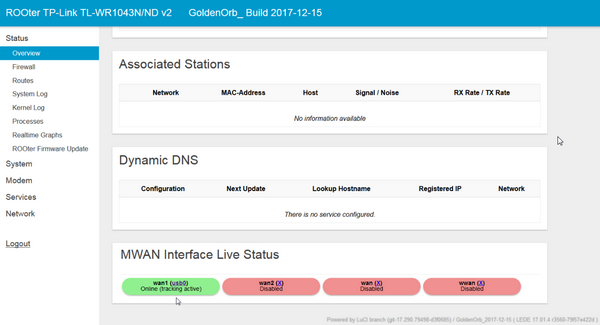 It is possible to configure both the WAN (the physical cable) and 4G at the same time. The zoning options are numerous. It is even possible to create quest wifi. In the picture below it shows the out of the box setup. 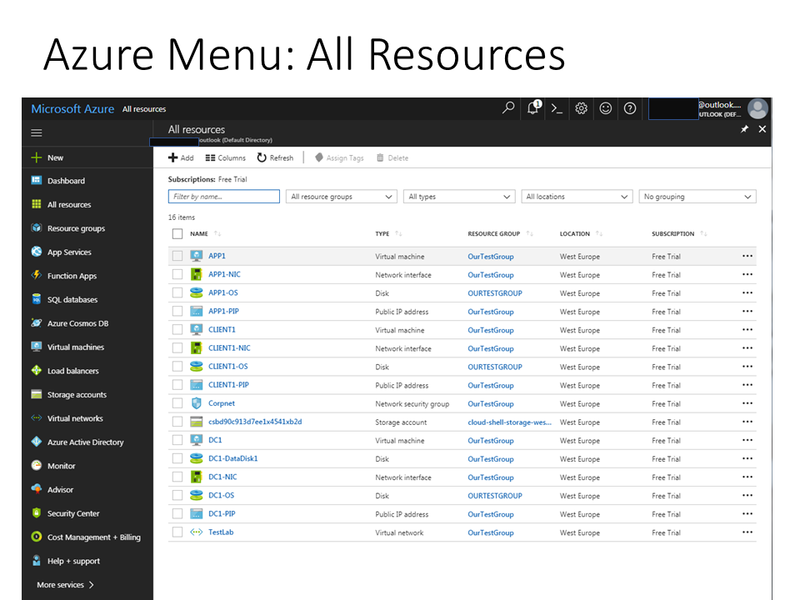 Microsoft is providing 30 day trial environments for Office 365 and for Azure. These trials can be used to setup a test and development environment by following the step-by-step guides from MS. If you are intending to start using those environments, then these Test Lab Guides can be very usefull way to get familiar on what is available and how it really works. In the beginning it is a little confusing, as the MS guides do not show the overall big picture before starting. This might be partly because the environments are being slightly changed all the time. The picture below is trying to show that in the O365-Azre test/dev environment, there are 3 different Active Directories involved. The different portal structure between O365 and Azure can cause confusion. The picture below is trying to show the different portals used to administrate these environments. In Azure, one portal is used, but in O365 the main Admin portal is used as jump board to access other portals… (I would assume this to change in the future). 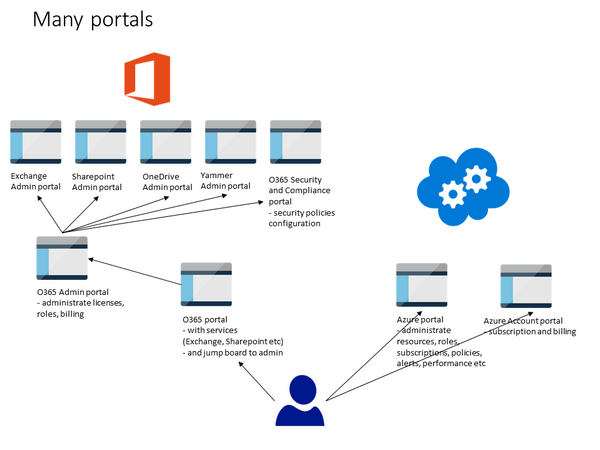 Please note that it is possible to login to Azure portal with the O365 userid. This is because Azure is providing the Azure AD function from Azure to the O365. BTW, after trial period, it is possible to continue this test/dev environment and pay for the services without loosing the data from trial. 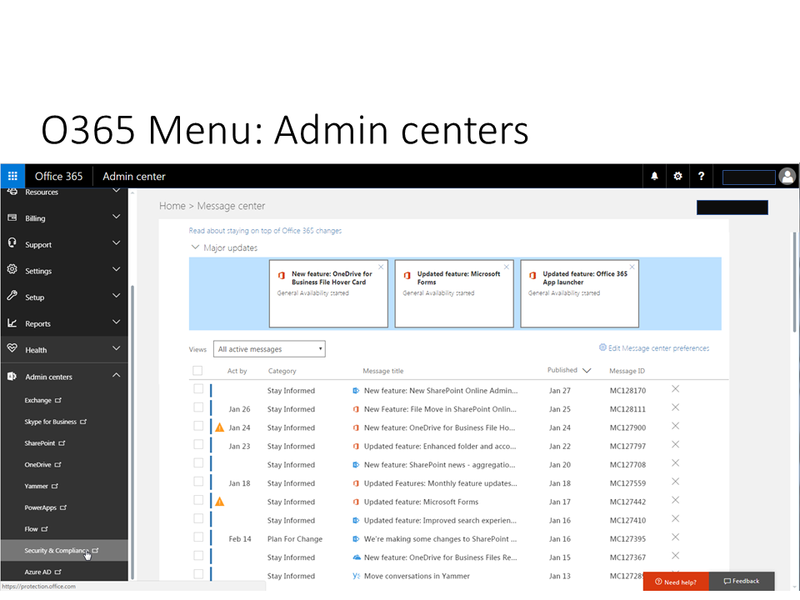 In Office 365 Admin portal, all what is needed, is there. However, the implementation is done the way that different sub-menus are actually only jump boards to other portals. For example, Security and Compliance is a separate portal. When it comes to Roles, then the issue becomes quite complex in the beginning. 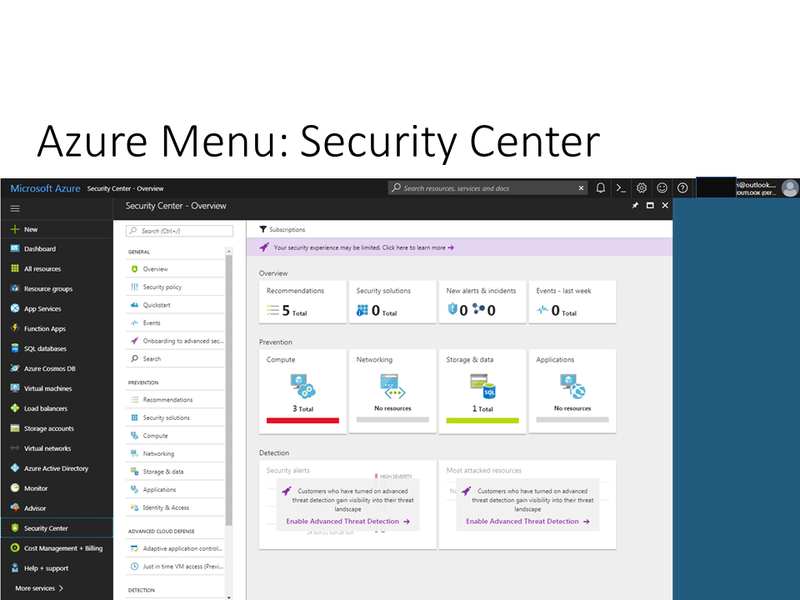 In the MS approach, security related roles like Security Administrator and Security Reader do not have access to security related configuration within diffrent services, but they only have access to central alerts, classification and policies configurations. I have not yet been able to identify a suitable reader role that could have read-only access to security related configuration in Exhange, Sharepoint, Yammer etc. It seems that this would need a customized role configuration. 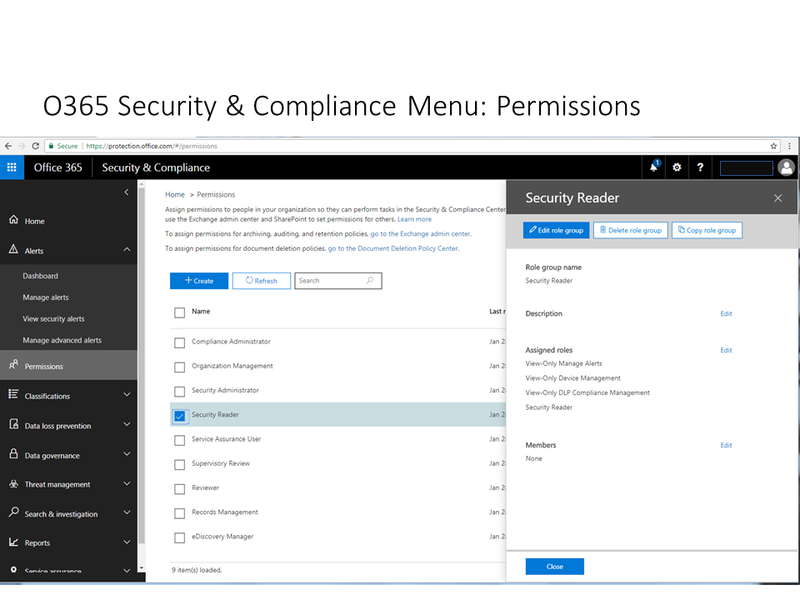 (Note that in the azure environment, one can have a Reader role for a subscription which can see all data as read-only (“Reader”, not “Security Reader”). 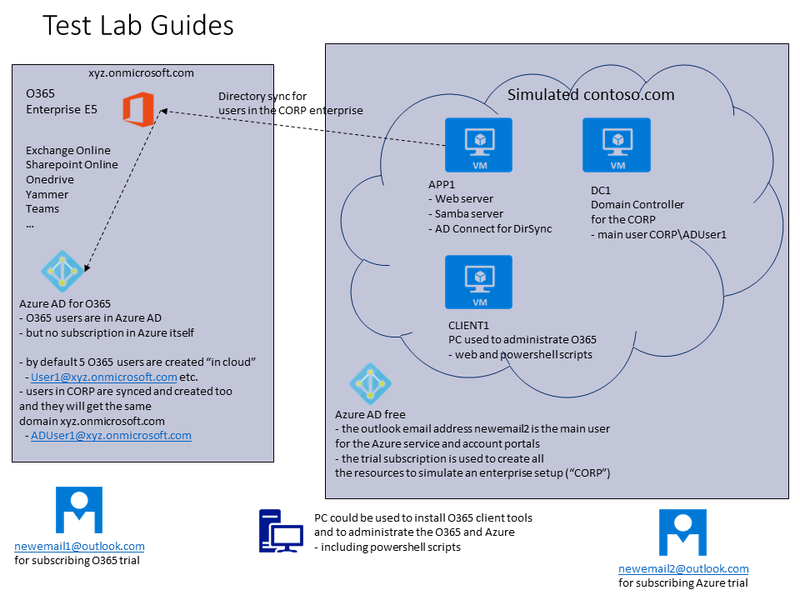 The screenshot below shows how Azure portal looks like after the setup with AD Connect is ready. In order to reduce the costs, it is good practise to stop the VMs when they are not needed. 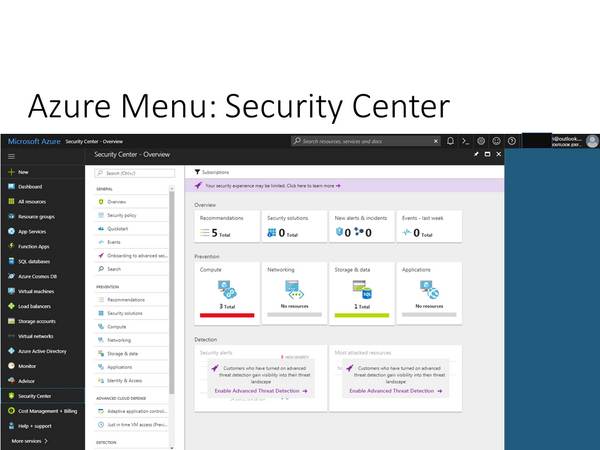 In Azure portal, the Security Center is build into the portal and is not a separate portal like in Office 365. One of the handy tools to have is virtual magnifying glass. It can be a solution when one need to enlarge only a portion of the display. For example, if you want to show some video or demo on a large screen, and the application does not support making it visually bigger. Or it can be a necessary tool for people with low vision. There also exist a portable version (with portable apps). 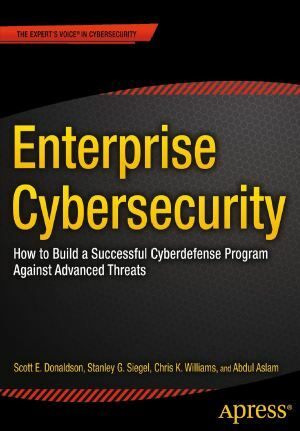 I was positively surprised about this book “Enterprise Cybersecurity“, and I can happily recommend it to anyone working with security management. There are more than one way to do the things, and this book is showing one alternative way on how to connect the dots between different concepts in cybersecurity. Author : Donaldson, S., Siegel, S., Williams, C.K., Aslam, A. Book is showing a holistic view on the cybersecurity, and is able to do it in a good guiding way. 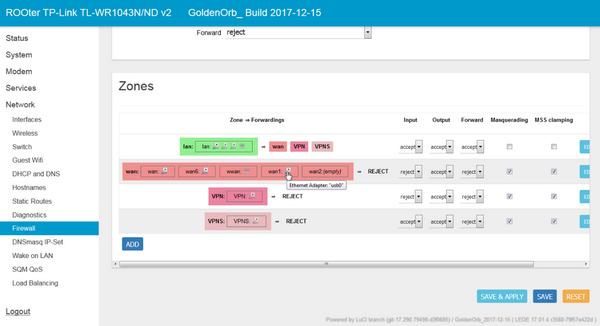 Even though there are several references to NIST framework, it is still used as part of the bigger program, and would not restrict to use any other framework as a base.